Space station managers on Wednesday approved plans for Sunday's scheduled departure of SpaceX's Dragon commercial cargo spacecraft filled with nearly one ton of failed parts, experiments, and precious blood and urine samples for return to Earth. Astronauts are loading approximately 1,673 pounds of cargo into the privately-owned spacecraft, which arrived at the complex Oct. 10 following launch from Florida on a Falcon 9 rocket. The return trip will allow researchers to begin analyzing biological samples left aboard the space station following the last flight of the space shuttle in July 2011. Without the shuttle, NASA and its space station partners had no way to return significant cargo to Earth, putting a hold on many major scientific investigations. When the space shuttle was making regular visits to the outpost, researchers routinely received fresh blood and urine samples, and engineers could refurbish old equipment instead of building and launching new hardware to replace broken parts. "The SpaceX Dragon is a really important vehicle for us because it supports the laboratory use of the ISS both in bringing cargo up to the space station and in bringing research samples home," said Julie Robinson, NASA's space station program scientist. The Dragon is slated to carry 384 syringes of urine and 112 tubes of blood collected since July 2011 from astronauts flying on the space station, according to Scott Smith, a nutritionist at NASA's Johnson Space Center in Houston. The samples will be packed inside powered freezers or refrigerated bags stuffed with bricks of ice. Researchers will analyze the blood and urine to study how the human body responds to exercise and nutrition in space. Components from the space station's crew health, life support and electrical power systems are also on the Dragon's return manifest. "We bring back almost 2,000 pounds of cargo, much of that related to research, although we will use it to bring back some failed [parts] we would like to get repaired," said Mike Suffredini, NASA's space station program manager. "It's good to have that capability back." Engineers can learn from hardware failures and NASA saves money by repairing broken parts instead of building fresh units. "Not only do you save some money, generally speaking, when you're able to repair [parts] and return them to orbit, but also you get to do the failure analysis," Suffredini said. "Sometimes failures will elude you if you're not able to get hardware back on the ground to check it out." After the shuttle's retirement, NASA is turning to commercial operators to fulfill the space station's logistics needs. Russia, Europe and Japan continue flying their own supply vehicles, but they only deliver cargo and burn up in Earth's atmosphere on their way down. 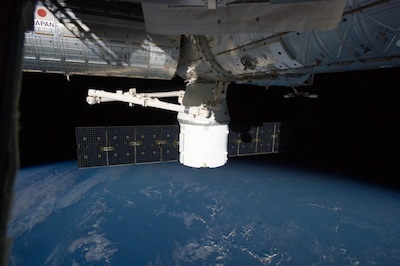 SpaceX has a $1.6 billion contract for 12 resupply missions with the Dragon spacecraft. NASA also signed a $1.9 billion deal with Orbital Sciences Corp. to fly eight delivery missions, but like the international cargo spacecraft, Orbital's Cygnus vehicle is designed to burn up at the end of its missions. "[Dragon] essentially replaces the capacity that we lost when the shuttle retired, so that now we can bring home a wide variety of biological samples, physical sciences samples, and we'll be able to bring home research equipment that we need to refurbish and then relaunch for the next set of experiments," Robinson said. On Sunday, the space station crew will remove the Dragon capsule from a berthing port and set free the craft to fly away from the outpost. Release is set for 9:26 a.m. EDT (1326 GMT). The spacecraft will fly a safe distance from the space station, and controllers at SpaceX's mission control center in Hawthorne, Calif., will command the capsule to fire thrusters for nearly 10 minutes around 2:30 p.m. EDT (1830 GMT). The burn will slow Dragon's velocity and allow the ship to drop from orbit, heading for a fiery re-entry over the Pacific Ocean. Shielded by a capable carbon material called PICA-X, Dragon's blunt end will be protected from temperatures of up to 3,000 degrees Fahrenheit as the spacecraft plunges back to Earth at 25 times the speed of sound. Three 116-foot-diameter parachutes will deploy to slow the craft's descent to a gentle velocity of about 11 mph. Splashdown in the Pacific Ocean about 500 miles west of Baja California should occur at 3:20 p.m. EDT (1920 GMT).